To be honest, that quote has always bugged me. When anyone has quoted it to me, I've been in the thick of working a job I didn't really love. I've had some interesting jobs: hotel babysitter, live-in nanny, live-out nanny, painting instructor, registered nurse. There have been aspects of all of them that I've liked, but as a whole, they haven't been my dream jobs by any stretch. Right now, though? I'm going to have to revisit that quote. Because it's really, really true. I have two part-time jobs that add up to full-time hours on top of being Liam's mom (which, as you know, feels completely full-time in itself). I stay busy, but as cliché as it sounds, I don't feel like I work a day in my life. One of my "jobs" is Brighter Day. I get to interact with customers, make bags and earrings, sell them to brides and customers and stores, and support a great cause. My other job is a recent addition, getting back to my love for art: I'm painting. The company I used to teach for needs new paintings for their database, so I'm painting fifteen new paintings a month. The paintings aren't incredibly detailed or difficult, which is by design - they need to be taught to a group of beginning artists (some of whom have never painted before) in 2 to 3 hours or less. Just this past week, I had to reevaluate what I'm doing. I'm seeing my nursing school buddies transition into their second nursing jobs. They've worked for one year and are now finding jobs in fields they love. It makes me wonder why I went through the craziness of nursing school only to work for a few months, have a baby, and then sew and paint full time. 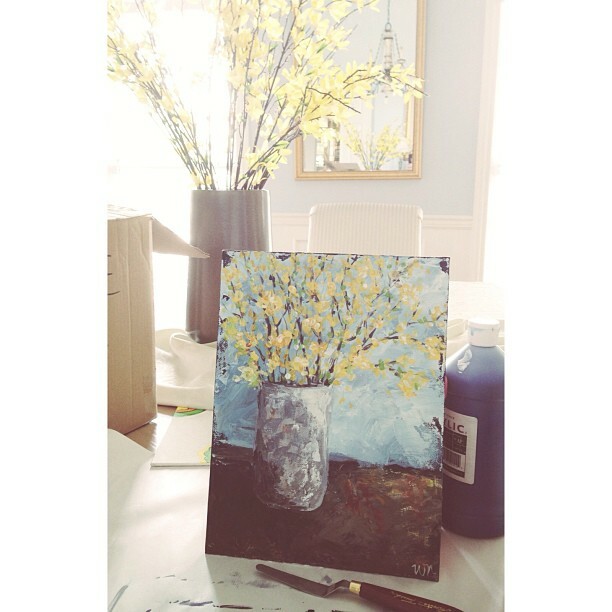 But when I really think about it, in this season, I've got my dream jobs: crafter, painter, mom. I get to do it all from home, create my own hours, drink gallons of hot tea, and not miss out on a moment with my son. Who knows how long this season will last, but I'll soak it up and thank Jesus for it while it does. I went to university in Australia (where I live) and did a 4 year Occupational Therapy degree and then only worked in the field for 2 years. People asked me why I then took an office administration job after all that work. There were various reasons I did, but even if I never go back to OT, the life lessons and skills I learned during my university study are just as valuable to me as the 'job' skills I learned and it definitely wasn't a waste of time. Plus, the pediatrics units and experience I had as an OT will come in handy for kiddos in the future I'm sure. I just have to trust that God's bigger plan will lead me where I need to be and that He uses every situation to teach me the things I'll need for it. You ARE lucky! Do you think you'll ever profit from your blog? I love your honest writing style and adorable pics! Random- Any idea when Brighter Day will open back up? This painting is perfect. Are you able to sell any of these? I wish, but I'm not. :( At least at this point.